Last summer I took my two nieces (then 2 and 4) blueberry picking. They had an amazing time, and amazingly learned to tell the difference between a blueberry that was ripe and one that wasn’t. And so we did. And even the blueberry-muffin-haters among us loved them. I made a triple recipe, thinking I’d freeze a bunch. That wasn’t necessary; they were gone in a day. You might have a blueberry muffin recipe you love, but I promise you- you will NOT regret trying these amazing muffins! The delicious cinnamon-y topping gives them this irresistible appeal, and the amazing texture makes them absolutely unforgettable. Preheat oven to 400 degrees. Line a muffin pan. In a large mixing bowl, mix the first four ingredients. Pour the oil into a 1-cup measuring cup. Add the egg to the cup, then add milk until the top. ; Pour into flour mixture and stir to combine. Gently fold in the blueberries. (If using frozen, toss the blueberries with a tablespoon of flour to help keep the color from spreading too much.) The batter will be very thick, closer to a dough. Fill muffin cups right to the top. Combine topping ingredients until they form coarse crumbs. Cover the tops of the muffins with crumbs. Bake for 20-24 minutes. For non-dairy muffins: sub the milk with non-dairy whip topping, not soy milk, to preserve the richness and texture of the muffin. Yields about 10 muffins, but I always double this recipe. You definitely have to try these- you’re the reason I made them (looked familiar, huh?). I’d take a couple of these for breakfast please. Heaven! Heaven! Heaven! Made these today and they are just delicious! Thanks for another winner recipe! Does this yield 10 large muffins or cupcake SZ? which of the ingredients are for the crumbs? don’t see any separation… really want to make these. I received your latest cookbook as a gift, and have immensely enjoyed a few recipes already. 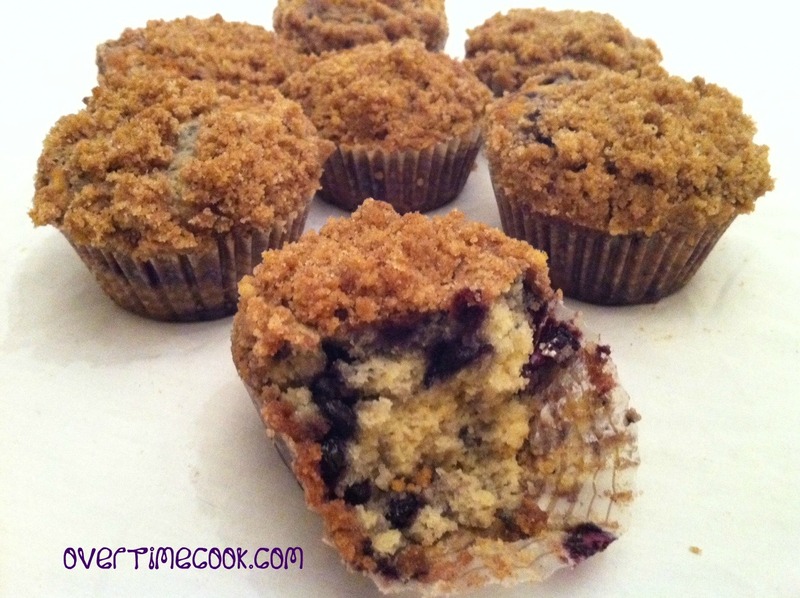 About these blueberry muffins – I made them yesterday, and the batter came out really thick, like a cookie dough. I checked, and rechecked the ingredients, and I know I followed it to the T. I had not yet added the last 4 ingredients, since those are the crumbs. Is it supposed to be a runny batter? They do taste great though, hope to make them again soon! THe batter is definitely thick. I have heard from a gazzilion people who loved these as written, so try again the way it says, and I am confident you’ll love them too.